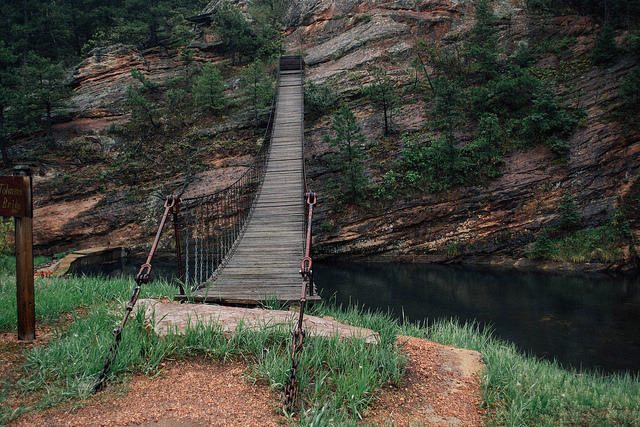 A foot bridge hovers over a small pond on the grounds of Sandstone Ranch in Douglas County. “Quality of life is the most important outcome of our work,” Douglas County asserts on its website. By key measures it’s succeeding: Douglas is Colorado’s healthiest county in terms of both quality of life and length of life, according to the County Health Rankings in 2018 and 2017. More validation: When county voters were asked in an independent survey about whether Douglas is “a good place to raise a family,” 97 percent agreed, according to the results from June 2017. Recreational areas abound in Douglas, where many residents are outdoor fitness enthusiasts. More than 63,000 acres of the county’s 843 square miles are protected through the Douglas County Open Space Program. Pike National Forest, Roxborough State Park, Castlewood Canyon State Park and the Chatfield State Recreation Area compose more than 146,000 acres. That many residents here maintain healthy lifestyles is evident in the 2018 County Health Rankings. Physical inactivity is a low 10% compared with a median 24% in the Exurbs. In all other community types, the median for this category ranges between 21% to 32%. The adult obesity rate is 18% compared with the Exurban median of 30%. Abundant exercise opportunities are noted in the Rankings — 93% have access in Douglas compared with 78% in the Exurbs. 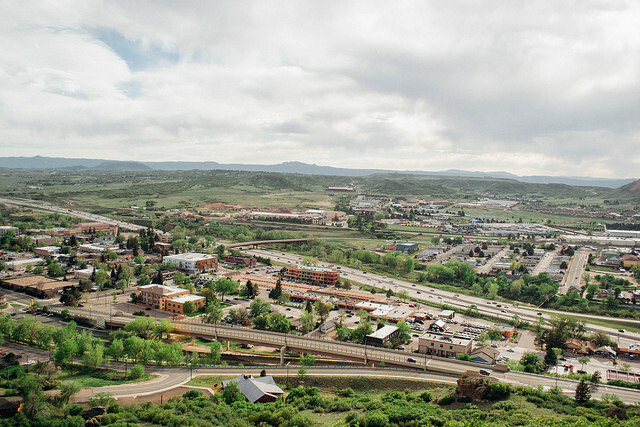 While the panoramic vistas and fresh mountain air distinguish Douglas County among America’s 222 Exurbs, the rural terrain and increased density closer to the metro areas (Denver and Colorado Springs) are signature characteristics of this community type. Also following Exurban trends is Douglas’s lack of racial and ethnic diversity: Hispanics make up 8% of the population, Asian Americans 5% and African Americans 1%. The county’s health factors are solid. Residents are well-educated, with 58% holding bachelor’s degrees; the median household income at $112,400 is well above the national average. Just 3% of children are in poverty in Douglas; the Exurban median stands at 18%, according to the Rankings. Moreover, the violent crime rate, defined as the number of reported violent crime offenses per 100,000 population, stands at 82 in Douglas; the median reaches 160 in the Exurbs overall. The biggest way Douglas stands apart from its Exurban peers: It’s in the thick of warp-speed growth, skyrocketing from a population of 285,465 in the 2010 Census to 328,632 in the 2016 Census Population Estimates. Seemingly in an adolescent growth stage, Douglas is more clearly defining itself and what it wants to become. The 2017 survey showed that 81% of county voters believe Douglas is growing too fast. Hardly content, residents bring an intentional and responsive mindset to the most pressing challenges affecting the county’s overall health: mental health, the availability and affordability of housing and funding the transportation infrastructure improvements needed to mitigate congestion and increase safety. Their practical solutions are yielding results — and helping the county continue growing up strong. Through the Douglas County Mental Health Initiative, supported by the county commissioners, 40 community partners help connect people with mental health services they need. Since May 2017, the county has created two Community Response Teams — and is achieving promising results. A master plan with many modes of transportation is in the works; the county is also helping seniors, people with disabilities, low-income residents and others get from point to point through a partnership with Lyft and faith-based organizations. Douglas County is attuned to mental health, an issue that takes different forms. Social connectedness is considered crucial to individual and community health, and social associations are a measure for this. According to the County Health Rankings, social associations in Douglas County stand at 5.9 per 10,000 population; in Colorado, the number reaches 8.7; in the Exurbs nationwide, the figure is 9. In comparison, the top U.S. performers post a rate of 22.1. 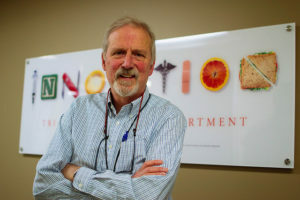 Douglas County also contends with binge drinking and substance abuse, affecting mental health, says Dr. John Douglas, executive director of the Tri-County Health Department. Suicides are the most heart-wrenching, extreme end of the spectrum. In June, the Centers for Disease Control and Prevention’s national study on suicide rates across America showed that Colorado’s rate spiked 34% between 1999 and 2016. (The national study revealed that more than half of those who died by suicide did not have a diagnosed mental health condition.) Still in the minds of residents here are the 1999 Columbine High School massacre in Littleton and the 2012 movie theater mass shooting in Aurora, both in adjacent Arapahoe County. Dr. John Douglas, Executive Director, Tri-County Health Department. Since 2014, the Tri-County Health Department — including Douglas, Adams and Arapahoe counties — has been laser-focused on mental health in its public health improvement plan. “In very preliminary feedback, access to mental healthcare and mental health remain the top two community health concerns,” says Dr. Douglas. Douglas County has been tackling the issue head-on after a series of tragic incidents in the past few years. The Douglas County Mental Health Initiative, supported by the county commissioners, has gathered community partners to meet residents’ mental health needs. Meeting regularly are more than 50 people from 40 institutions across the county, including health, police, courts, media, churches and schools. The county also teams with Tri-County Health on the “Let’s Talk Colorado” campaign to decrease the stigma around mental illness, and through conversation, encourages people seek help if they need it. Meanwhile, Colorado Community Media, which covers Douglas County, has been writing a multipart “Time To Talk” series and holding community forums on mental health issues. Also on the ground is the Community Response Team (CRT), formed in May 2017 as part of the county’s initiative. Composed of fire/EMS, law enforcement and a clinician from a private psychology practice contracted by the county, the CRT is dispatched to the scene of a mental health situation. The team responds to calls from 911 and other sources, evaluates people on scene, steers them from emergency rooms and jail and connects them with the necessary mental health services. In January, the county added a second CRT; each one has a case manager. The county has added case management software to better coordinate care. The results are encouraging: Of the 1,001 encounters from May 2017 to May 2018, the CRTs have prevented 142 emergency department visits and 53 arrests, according to the county’s recent data. The CRTs referred 163 people for case management and 75% successfully engaged. The county estimates it’s avoided more than $1.7 million in costs to emergency departments, EMS/fire and detention facilities. Besides the CRT, the county employs a Mental Health Navigator to handle mental health needs coming to the County Attorney. The navigator works with clients on a specialized care plan and helps families move through the system. 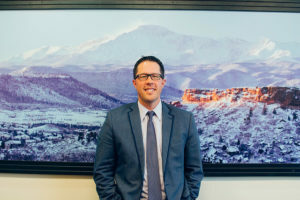 Listen to Dr. John Douglas, executive director of the Tri-County Health Department, talk about the attributes of Douglas County, Colorado, as well as why and how the county addresses the issue of mental health. Douglas County broadly appeals for its lifestyle, safety and economy. When voters were asked in the 2017 survey whether Douglas is “a safe place to live and work,” 98% said the statement was accurate. Frank Gray, President/CEO, Castle Rock Economic Development Council. The county and residents embrace small government and letting the individual prosper — of particular interest to businesses. Douglas is home to Fortune 500 companies: DISH Network, Liberty Media, Charles Schwab and Qurate Retail. Where unemployment is under 3%, the top sector is professional and business services. Other major industries are telecommunications, healthcare, financial services, retail and leisure and hospitality. The Outlets at Castle Rock, filled with brand name retailers in the county seat, is the No. 4 tourist attraction in Colorado, according to the Colorado Tourism Office. With property taxes low, sales tax is a key revenue generator, says Frank Gray, President/CEO of the Castle Rock Economic Development Council. 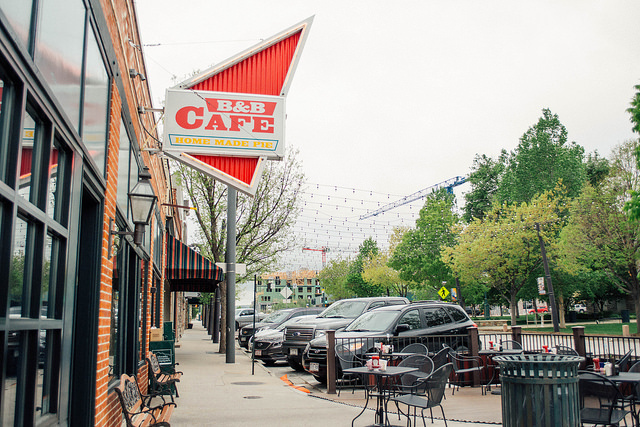 Downtown Castle Rock, Colorado, the county seat of Douglas County, features small-town charm. Although Douglas County was founded in 1861, its growth is relatively recent, and some sectors are working hard to keep pace. Demographic shifts present particular challenges in housing. At the same time people of varying ages continue to migrate to Douglas from other areas, many residents are choosing to age in place. The median age in Douglas County is 37.8. The State Demography Office projects that by 2030 about one in four residents will be age 60 or older. Sterling Ranch, a $4.4 billion development in northwest Douglas County, is being built to meet the needs of a growing, multigenerational population. Multigenerational housing is being built to accommodate. 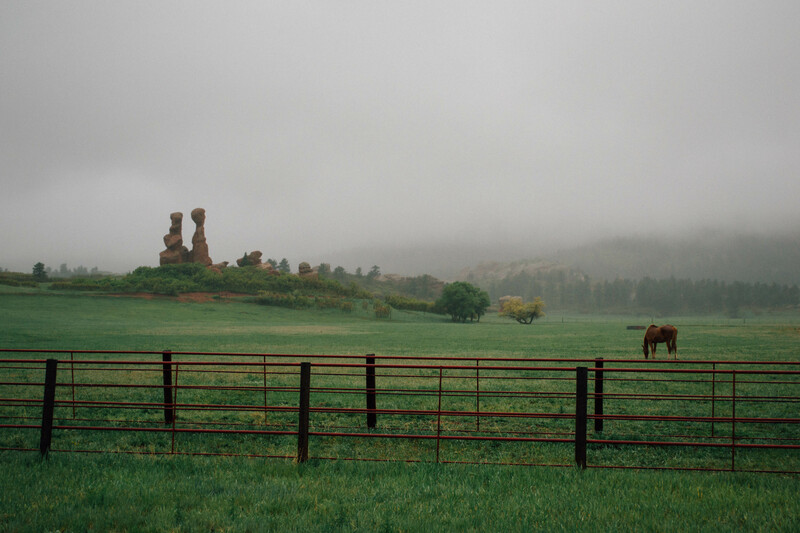 One master-planned community is Sterling Ranch, a $4.4 billion, sustainable development in the northwestern part of the county, located near two state parks and three regional parks. Homes range from the $400,000s to more than a million. 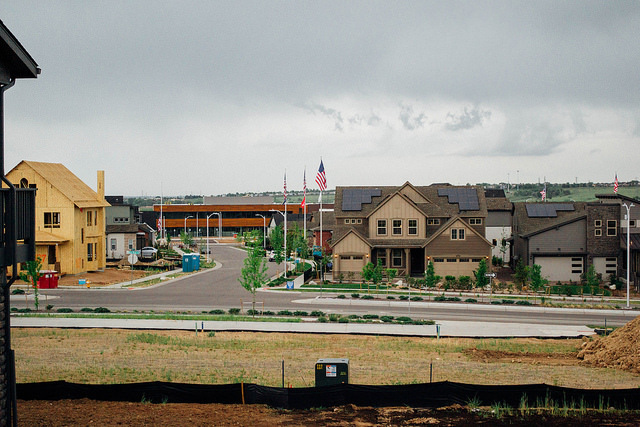 The first village, which has welcomed more than 100 families so far, is slated for about 800 homes built in authentic Colorado architectural style. Plans are to build more than 12,000 homes in Sterling Ranch within the next 25 years, housing more than 30,000 people. In addition to homes and recreation, the 3,400-acre development will feature churches, schools and shops. Some 15 miles east in affluent Lone Tree, where the median price of a single family home is $591,000, sits RidgeGate, a 3,500-acre mixed-use, sustainable community of homes, retail and restaurants, parks and open space, the Sky Ridge Medical Center, office space and light rail. In 2017, 3,416 new housing units were completed all over Douglas County, representing a 2.8% increase in housing stock from 2016. The median price of all homes sold in the third quarter of 2017 was $456,013, an increase of 5.4% compared with the same time frame in 2016, according to county data. On affordable housing, Douglas County could do more to help middle and low-income earners, such as teachers, police officers and retail workers, say Douglas County Housing Partnership leaders Diane Leavesley and Artie Lehl. Douglas County Housing Partnership works with private sector developers to offer rental housing built with low income housing tax credits (LIHTC) and other programs. The Housing Partnership provides down payment assistance for first-time homebuyers who have incomes at or below 80% of the area median income, but the purchase price cannot exceed $361,000. (For a new build, it’s $413,000.) This essentially puts prospective buyers in the condo market. In spite of the challenges, different types of housing are getting the green light. More than 500 LIHTC apartment units have been built in the past five years in Douglas County. Next year, nearly 400 more are set to be built. Of the 3,956 housing units permitted in 2017, the county reports that apartment units made up 34% of the total new permits. For LIHTC apartments, interest lists typically fill up within days, housing partnership leaders say. Skeins of roadways are ubiquitous in Douglas County, and residents say traffic is a concern. Traffic and long commutes also put a strain on daily life in Douglas County, where 78% of the workforce drive alone to work, according to the latest County Health Rankings. In the Exurbs, the median is 83%. Among the workers commuting alone in Douglas, 42% drive more than 30 minutes to work. In the Exurbs nationally, a median of 45% drive this long to work. The top U.S. performers post a rate of 15%, the Rankings show. It’s not surprising, then, that just 27% of Douglas County voters agreed with the statement that “traffic across the county seems to be improving,” according to the 2017 survey. At the same time, 66% were satisfied with “traffic management”; in the 2014 survey, the satisfied figure reached 84%. The picture is muddier when drilling down to consider other forms of transportation. While 54% of voters said “the transportation system is safe and effective,” 46% want to spend more money for a “safe, affordable & accessible transportation system for residents and visitors,” according to the 2017 survey. Some community leaders are hearing about gaps in transportation. Some in Douglas County say the fixed bus route system is not meeting their needs, says Doug Tisdale, chairman of the board of directors at Regional Transportation District (RTD), which includes eight counties and provides light rail, fixed bus routes and commuter rail that’s similar to Amtrak. Where there are gaps, RTD is trying to fill them: a call and ride system helps people move from where they are to a light rail stop or another point; access a ride helps travelers who have mobility issues or cognitive challenges. Separately, Douglas County partners with Lyft and faith-based organizations to help older adults, people with disabilities, low-income families and others get where they need to go through a volunteer-run operation. In Douglas County, RTD’s southeast rail line will expand to three more stations in Lone Tree by early 2019, Tisdale says. The southwest line includes a planned extension into Highlands Ranch, but funding is an obstacle. Through the building process, culture and assumptions surrounding mass transit remain, Tisdale says. He points to Douglas County’s independent streak, including Castle Rock’s past decision to opt out of the regional district. Others believe that a train or bus stop should be near them wherever they are or that a train line will eventually be extended. Misconceptions about transit users are hard to shake, he adds. In Tisdale’s experience, riders are workers, students, and families heading downtown or to the airport.